SNP MSP for Banffshire & Buchan Coast, Stewart Stevenson has called for answers over out-of-control spending at the Scotland Office as new figures show that the cost of Secretary of State David Mundell’s department has rocketed 20% since 2011/12, at the same time as the Scottish Government’s budget has been cut by the UK Government, and the devolution of significant new powers to the Scottish Parliament means the work of the UK Government in Scotland is lower than ever before. New figures verified by the House of Commons Library revealed that the expenditure of the Scotland Office - which answers to the only Scottish Tory MP David Mundell - has soared by an eye-watering 20% in real terms since 2011/12. Confirmation of Mr Mundell’s department’s spending comes as the Scottish Government revenue budget – the funds that pay for Scottish public services – has been cut by the Tories by almost 2% in real terms over the same period. In effect the Tories are creaming off money that should go to the Scottish Government to spend on public services to instead increase spending for the Tory-run Scotland Office. In summer, parliamentary questions from SNP MPs revealed that at least part of this increase has been prompted by the rapidly increasing cost of the Scotland Office political spin operation. Since 2011/12, the expenditure of the Scotland Office on communications has more than doubled to £426,223. Mr Stevenson has said there are some serious questions for the Tories to answer about where the money is going and why the Tories are happy to give massive increase in budgets to their own department whose responsibilities are limited at the same time as cutting the Scottish Government’s budget. The MSP also said the revelation that Scotland Office spending had increased was particularly galling, as the transfer of new powers to Scotland means the work of the Scotland Office has been reduced. “The Scotland Office has long been a zombie department with next to no responsibilities. And with more powers transferring to the Scottish Government, as David Mundell so enjoys telling us, it would be interesting to hear his explanation for why his department requires such an enormous increase in its budget. “We know that the budget for Mundell’s army of spin doctors and publicity campaigns to promote the benefits of the Union to the people of Scotland has more than doubled. Perhaps he needs the extra help in trying to devise a believable reason for why he has u-turned on the Single Market and why he believes the people of Scotland should suffer Brexit despite not voting for it. “At a time when households are being told by the Tories to tighten their belts and Scotland’s budget which pays for public services is being cut so savagely to the tune of £2.6 billion by 2019/20, people are entitled to ask just what David Mundell has done to deserve his budget boost and what is he spending it all on? “David Mundell’s Tory colleagues in the Scottish Parliament were quick to criticise the SNP back in summer over spending on the National Survey – a complaint that turned out to be without foundation. If they are so concerned by the use of public funds to support political ends, then I hope they will support my call for David Mundell to explain just exactly what his Department’s budget boost is funding. A study into options for the North-east dairy industry supported by Aberdeenshire Council and Opportunity North-east (ONE) has identified potential investors. The study was initiated following the decision by Muller Wiseman to close their milk processing plant in Aberdeen and truck milk to Bellshill, Lanarkshire, for processing, for which producers are charged 1¾ pence per litre. This, coupled with low milk prices over recent years has put the future of the North-east dairy sector in serious doubt. Now, the second stage of the dairy study has seen a prospectus selling the North-east dairy opportunity prepared and widely promoted in the UK and internationally. Three serious investment prospects have emerged from this work. “I am delighted that a number of potential investors have expressed an interest in the opportunities which exist in the milk sector here in the North-east following the decision by Muller Wiseman to close their operations here. SNP MSP for Banffshire & Buchan Coast, Stewart Stevenson has welcomed a significant rise in the number of council houses and new social rented sector homes in development compared to last year, as well as an overall increase in housing supply – as revealed by National Statistics for Scotland figures published today. While the Labour/Lib Dem Scottish executive built only six council homes during their time in office, council house building has been revived under the SNP, with right-to-buy scrapped. Central to the Scottish Government’s ambition to make Scotland “fairer and more prosperous” is the commitment to building at least 50,000 new affordable homes over this parliament. The latest analysis shows that new local authority housing starts and completions have risen (26% and 12% respectively) since last year, and more social housing is being built across Scotland. “It is really encouraging that housebuilding in Scotland is on the up – particularly when it comes to new social housing and council-built developments. “The number of social housing homes built between April and June this year was up 77% on the same period last year. And on top of this there was a 26% increase in new local council housing developments up to September 2016 compared to last year. SNP MSP for Banffshire & Buchan Coast, Stewart Stevenson is urging constituents to give their views on organ and tissue donation in the Government’s new consultation to help inform policy. The 14-week consultation looks at various ways to increase the number of people being referred to the donation services in Scotland and the number of times when donation is ‘authorised’ to proceed. The consultation asks whether the current system for authorising organ and tissue donation should be turned on its head. Currently in Scotland, organ and/or tissue donation after a person’s death only occurs if they have given advance authorisation or if their nearest relative authorises on their behalf. A soft opt out, or deemed authorisation, system is being explored whereby donation can proceed if the person has not opted out or told their family they do not wish to donate. The study will also look at whether clinicians in Scotland should be given guidance on referring potential donors, so that the possibility of donation can be explored at an earlier opportunity. “With the amazing help of donors and their families, NHS Scotland has achieved huge amounts in recent years. Since April this year, there has been 85 organ donations made after death compared to 60 over the same period last year. “However, there is more we can do for those who are still waiting for a transplant and it’s essential that we make sure we’re doing all we can. “The Scottish Government are asking the public whether a ‘soft opt out’ system is preferable to the current system where a person must explicitly opt in to donating. The government are monitoring progress in Wales carefully to learn lessons from their experience of introducing a new opt out system. “I welcome this consultation as an opportunity to discuss ways of increasing organ and tissue donation and hear views from a wide range of people. Banffshire & Buchan Coast MSP, Stewart Stevenson has welcomed the statement from Cabinet Secretary for Rural Economy, Fergus Ewing, who outlined changes to bear down on costs and incentivise the CAP Futures system. Mr Ewing explained that the Scottish Government expected to see savings of more than 10 per cent on the cost of the contractor in November. Furthermore, as a result of negotiations with the contractor, there will be a new penalty and service credit regime in place. This will incentivise timely delivery of the CAP Futures system and impose financial penalties where those timetables are not met. “This is a very positive statement from the Cabinet Secretary. It’s essential that the CAP Futures programme is delivered as quickly and efficiently as possible. It is critical to our farming communities and overall agricultural sector. “With the changes resulting from these negotiations we will save money but also encourage commercial discipline in programme delivery. This gives the Scottish Government an important tool in enforcement – if the contractor fails on timely delivery, they will endure financial penalties. Banffshire & Buchan Coast MSP, Stewart Stevenson has welcomed support for farmers after the Ministerial Statement by Cabinet Secretary for Rural Economy, Fergus Ewing, on protecting Scotland’s livestock. The Cabinet Secretary re-announced the transition from the Cattle Tracing System to ScotMoves to record cattle movement data. Mr Ewing outlined what steps were being taken to encourage meaningful engagement with the new ScotsMoves system. The Cabinet Secretary highlighted that the scheme will come into effect on 1 January 2017 and has made sure a hotline will be available on January 1 for farmers to contact. He went on to say that the Scottish Government has taken steps to publicise the matter through specialised and general press, and assured the Parliament that officials in rural payments and inspections divisions offices will be ready to provide advice, support and back-up. “I welcome the assurances of the Cabinet Secretary. He’s made clear he’s committed to helping our farmers adapt to the new system. The Scottish Government wants a flexible approach and has assured us it will allow farmers to update data by first class post, fax, telephone or indeed online. “As we transition the Scottish Government aims to do whatever it can to assist farmers move to the ScotsMoves system. It’s the right approach and I’m glad the Scottish Government has taken an extra step by keeping a hotline open on New Year’s Day to help our farmers. Christmas pudding aficionados face the price of their favourite festive dessert rising sharply this Christmas in the wake of Britain voting to leave the EU. A slump in the pound is behind the increased cost of Christmas pudding since many key ingredients such as dried fruit, spices, sugar and brandy are imported from abroad. According to Mintec, the principal independent source of global pricing information for commodities and raw materials, the costs of Christmas pudding ingredients have risen by 21 per cent in 2016. A Rabobank report looking at the impact of Brexit on beverage producers also noted the impact of a devalued British pound on drinks imports, such as port and brandy, and uncertainty over trade barriers creating an “overall negative effect” on the industry – further driving up prices. Citrus peel and zest are key components in Christmas pudding recipes and experts suggest that the UK could face higher tariffs on oranges and lemons outside of the EU. Festive flavourings such as cinnamon, nutmeg and mixed spice could also see additional charges levied on imports. “For me there’s no greater treat at this time of year than a Christmas pudding and the troubling news that costs have skyrocketed in the wake of the EU referendum underlines a serious point. “The fact that a Tory hard Brexit could potentially land households with higher bills for food and drink matters greatly. And we’re now six months on from the vote without the slightest idea what Brexit means. That creates uncertainty which is bad news for business and, in turn, for consumers. “And with so many festive treats sharing the same key ingredients, it’s likely they’ll be hit with similar price rises – so that includes Christmas cake, mince pies and the Hogmanay favourite, black bun. 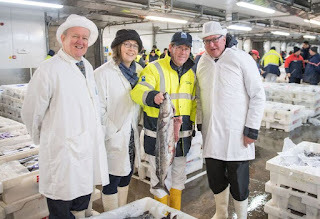 Banffshire & Buchan Coast MSP, Stewart Stevenson, has backed the Scottish Government’s proposals to keep Scotland outside the Common Fisheries Policy (CFP) but within the European Single Market. The paper – “Scotland’s Place in Europe” – was published today (Tuesday) and outlined the SNP’s determination for Scotland to remain in the European Single Market. The proposals advocate that the Scotland should remain a full member of the European Economic Area (EEA) but outside of the CFP. The paper also outlined substantial new powers that should be devolved to the Scottish Parliament as a result of Brexit. The proposals would give Scotland greater opportunity to develop and administer Scottish specific fisheries policies. “The Scottish Government has vowed to continue supporting our fishing industry and today we have it in black and white. The SNP has long been opposed to the CFP and I hope our fishermen take heart at this announcement. “The Scottish Government is committed to getting the best opportunities for our fishing. Not only is the Scottish Government committed to being outside the CFP but will also press the UK Government to negotiate tariff-free access to the European Single Market for our fish products. That means we’re championing both fish processing and fish catching. Banffshire & Buchan Coast MSP, Stewart Stevenson has met Fraserburgh Academy Modern Studies students to assist them with research for their upcoming studies. Mr Stevenson joined Fraserburgh Academy Modern Studies teacher Barbara-Ann Hawkey to take questions from four of her Modern Studies students related to their upcoming work. Two of the students were in Advanced Higher (S6) working on dissertations analysing quality of life and how it is affected by policy while the two Higher Modern Studies (S5) students were preparing for upcoming exams. “The pupils had some very tough question – which certainly kept me on my toes. It was interesting to see what other dimensions we could tease out of their questions. “The students were very enthusiastic and displayed an important ability to redefine the parameters of their questions. The process allowed us to take a deeper look at the complex issues facing our society. Banffshire & Buchan Coast MSP, Stewart Stevenson has criticised the Tories for being clueless on Council Tax and scaremongering in the North-east. The Scottish Budget confirmed Tory threats of money being transferred to the central belt were utterly false. The Tories in the North-east have stated that money raised through Council Tax reform would be taken by the Scottish Government to fund the attainment gap in other parts of the country. Outlining the 2017-18 Local Government settlement as part of the Scottish Government Draft Budget, Cabinet Secretary for Finance, Derek Mackay said that the £111 million of additional Council Tax revenues expected to be raised from reform of the upper bands will be available to be spent locally. He announced the Scottish Government will use its own resources to fund £120 million going to schools to close the attainment gap. Support from the Scottish Government and local taxation provides an increase in spending power on local government services, not of £59.6 million, but of £240.6 million or 2.3 per cent. Aberdeenshire will benefit from a distributable budget of £431.8 million plus £8.3 million raised via local tax reform, totalling £440.2 million in support for services. “The Cabinet Secretary has been consistent on this – money raised locally will be spent locally. The Tories are either clueless or they have been deliberately scaremongering the people of the North-east. “The money raised in the North-east is staying here. Aberdeenshire Council will have another £8.3 million to spend because of these reforms. This money will play an important role in improving services in the North-east. SNP MSP for Banffshire & Buchan Coast, Stewart Stevenson has welcomed the new figures showing a 0.4% fall in unemployment over the year. There are currently 28,000 more people in work in Scotland compared to pre-recession levels, and employment levels for both women and young people are higher in Scotland than the UK as a whole, according to the latest Office for National Statistics figures. However the EU referendum and subsequent lack of leadership from Westminster has caused economic uncertainty, and leaving the single market would pose further risk to progress on employment and the economy. This is why the Scottish Government has taken steps to mitigate the uncertainty caused by Brexit – including investing an additional £100 million to stimulate growth and support jobs, as well as introducing a new £500 million Scottish Growth Scheme for small and medium sized businesses. “It is encouraging that unemployment in Scotland has fallen over the year, with more women and young people employed here compared to the UK. “The EU referendum and subsequent lack of leadership from the Tory government has however caused economic uncertainty, with unemployment rising slightly in the months following the referendum despite overall gains throughout the year. It is imperative for the North-east that we retain membership of the single market so that these improvements in employment do not go into retreat. “In the face of uncertainty the Scottish Labour Market is performing extremely well and the Scottish Government is investing an additional £100 million to help stimulate growth and support jobs, as well as a establishing a new £500 million Scottish Growth Scheme to support in particular small and medium enterprises. Banffshire & Buchan Coast MSP, Stewart Stevenson has tabled a motion before Parliament congratulating Macduff Scout Group on its recent LEADER grant funding success. The Macduff Scout Group has secured up to £64,560 LEADER grant funding to help refurbish the Scout hut in Macduff in Banffshire. The North Aberdeenshire Local Action Group has agreed to contribute 50% to the project. The project will seek to create a more efficient internal layout of the building, adding an extension, raising the roofline and providing a kitchen and ample storage in order to support broader community use. “I’m absolutely delighted for the Macduff Scout Group. The £64,560 LEADER grant funding is a huge boost for them. They deserve to have a suitable meeting place to conduct their activities. “The LEADER grant is an excellent programme which delivers a bottom up approach to rural development. It allows Local Action Groups to award grants to projects that support delivery of Local Development Strategies and is an important part of the Scottish Rural Development Programme. I encourage eligible community groups apply for funding. Banffshire & Buchan Coast MSP, Stewart Stevenson has called for consideration of the findings of ‘The Energy of Scotland’ report on renewable heat and transport. Mr Stevenson spoke during a Parliamentary debate on climate change targets and the findings of the recent ‘Energy of Scotland’ report. Mr Stevenson drew attention to the challenges that both renewable heat and transport and the importance of putting attention there. He went on to highlight the need to persuade people of new ways of working. “Scotland has already made incredible progress on climate emissions and renewable energy – especially electricity. However, significant gains can be made in heat and transport. The ‘Energy of Scotland’ report does the important task of showing us additional opportunities. “We continue to lead on climate change and the UK as a whole has led on climate change. Unfortunately, Scotland’s leadership is meeting challenges due the UK Government’s recent policy failures on renewable energy. “This process is not simple. As Minister for Transport, Infrastructure and Climate Change I encountered the challenges first hand. Part of our work is creating a society that is prepared to embrace sustainable solutions to transport and heat. There’s a lot of work to do and we need UK policy to help facilitate that work." Banffshire & Buchan Coast MSP, Stewart Stevenson has welcomed new statistics published today showing an increase of 52 since last year in hospital and community healthcare workers in NHS Grampian. Under the SNP government, NHS Scotland staffing levels are at a new record high, increasing by 9.1% over the last 10 years. Nursing and midwifery is also at historically high levels with 2,378 more dedicated staff. “Under the Scottish Government, NHS staff numbers have risen to record highs - with more consultants, nurses and midwives now delivering essential care for the people of Scotland. “Healthcare is a key priority for the SNP and I am really encouraged that there are 52 more dedicated health care workers working in NHS Grampian compared to last year – bringing the total number to 12,047. “In government, the SNP has ensured that NHS staff numbers have risen to record highs, with nearly 140,000 staff working in hospitals and community healthcare throughout NHS Scotland – an increase of 9.1% over the last 10 years. Banffshire & Buchan Coast MSP, Stewart Stevenson has offered his support for Children’s Hospice Association Scotland (CHAS) during anniversary event. Mr Stevenson joined members of CHAS at a Parliamentary event to mark the first year anniversary of the publication of Children in Scotland requiring Palliative Care: identifying numbers and needs (ChiSP). The report was co-commissioned by CHAS and the Scottish Government for launch in November 2015. The event also provided an opportunity for CHAS to welcome the Scottish Government’s recent pledge to provide approximately £30 million in funding over the next five years and for CHAS to discuss with key stakeholders how these additional resources will be used to improve lives. “I was proud to join CHAS and to hear about their inspiring work. Palliative care can be one of the most challenging times for families – especially when it’s for a child or baby. It’s absolutely crucial that we support families through these hardships. “Our research shows that there are many families across Scotland who are not accessing the care they need when their child is dying. “As Scotland’s national children’s hospice service we want to reach every family who needs us. I am delighted that so many MSPs, partners and families took the time to join us at the Scottish Parliament to discuss how we can meet the needs of the 15,404 babies, children and young people with life-shortening diagnoses in this country. Dr Eilidh Whiteford MP and Stewart Stevenson MSP visited the Fraserburgh Delivery Office on Friday morning to see first-hand the operation of delivering Christmas post and to pass on season’s greetings to its hardworking staff. 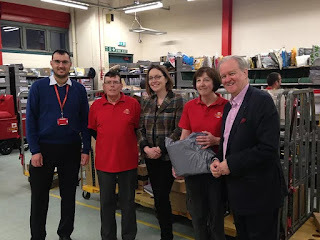 Dr Whiteford and Mr Stevenson were shown around the office by Delivery Office Manager, Chris Share, and were introduced to the postmen and women, who are pulling out all the stops to sort and deliver mail in the Fraserburgh area over the Christmas period. The Festive Season is Royal Mail’s busiest period, as millions of people shop online for gifts and send Christmas cards and parcels. As Royal Mail’s 500th anniversary draws to a close, this Christmas provides an opportunity to reflect on the centuries of hard work delivering to every single address in the UK. “It was a pleasure to show Dr Whiteford and Mr Stevenson our Christmas operation and to hear their kind words of encouragement and support. SNP MSP for Banffshire & Buchan Coast MSP, Stewart Stevenson has called for all political parties to speak with a single voice on fishing. Mr Stevenson spoke during the annual Parliamentary debate on sea fisheries and end-year negotiations. Mr Stevenson drew attention to the historical issues facing fishing and called for all political parties to speak with a single voice in support of fishing. 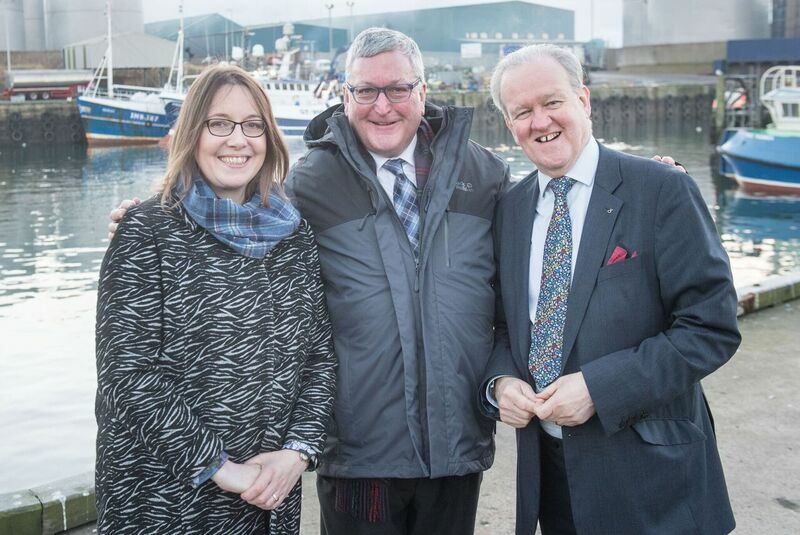 Calls for unity were echoed during the debate and by the Cabinet Secretary for Fisheries, Fergus Ewing. Mr Ewing announced that the Scottish Government would support all amendments to the motion in order to demonstrate to fishing communities that the Scottish Parliament, regardless of party, is completely behind them. The motion was supported by four out of five political parties and passed with all amendments but without support from the Tories. “There has been a long process of mistakes that have led us to our current position with the Common Fisheries Policy. The SNP has been opposed to it from the beginning. My colleague, Donald Stewart, who was leader of the SNP in 1982, speaking in the Westminster debate on the CFP, said of fishermen, ‘They have been betrayed. The result will be catastrophe.’ And it has been. “In Peterhead and Fraserburgh landings were worth about £150 million. That shows you what a massive impact these negotiations will have on my constituents – but it goes beyond them. Scotland has fishing communities from Lerwick in the north to Eyemouth in the south. Fishing communities across Scotland are watching these negotiations and it’s vital we get them the best deal possible. “During the debate I made it clear that fishing needs support across the political divide – Our fishing communities need us to unite behind them. I was very pleased to hear the Cabinet Secretary echo this sentiment. The Scottish Government sought to use this opportunity to unite the Parliament behind our fishermen. I’m disappointed that the Tories failed to support the motion – the Conservative amendment was accepted and four of the five parties in Parliament supported the motion. The Tories had an opportunity to send Scottish and UK fishing a clear message of support – instead they once again demonstrate that they’re only here to protect their own narrow political interests." Banffshire & Buchan Coast MSP, Stewart Stevenson has tabled a motion congratulating Modo – Circus with Purpose on successfully applying to Awards for All Scotland. Modo – Circus with Purpose has secured £9, 980 and will use the funding to deliver a new workshop programme. The programme “Oot and Aboot” will provide a youth café for people in disadvantaged circumstances and also increase Modo’s work with young people. “I’m very happy that Modo has secured the £9,980 funding from Awards for All Scotland. Modo already provides some great programmes – It’s amazing what they teach their participants. I’ve personally seen the confidence that Modo instils in young people and I’m sure this additional funding will allow Modo to create a beneficial environment to reach even more young people. “Awards for All Scotland is an excellent programme that gives groups across our country the opportunity to apply for grants of between £500 and £10,000 for various projects. I encourage all of our community groups to apply for funding. Mr Stevenson spoke during a Parliamentary debate on support for Scotland’s renewables. Mr Stevenson spoke about the important role renewables had to play in climate change and the need for the Government to be more supportive of the renewables sector. “Scotland has made some incredible progress on tackling climate change. We’ve managed to beat our climate change targets six years early. That is largely due to an incredibly aggressive investment and support of our renewables sector. 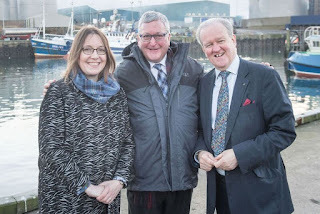 Banffshire & Buchan Coast MSP, Stewart Stevenson, has secured a Parliamentary Members’ debate on the Scottish Fishermen’s Federation’s (SFF) ‘A Sea of Opportunity’ campaign. Mr Stevenson secured cross party support for a Members’ debate on the points made by the SFF ‘A Sea of Opportunity’ campaign. The motion draws attention to the opportunities that will emerge for Scotland’s coastal communities resulting from full control of fishing in the offshore economic zone. The motion continues by emphasising the assertion by the SFF – that UK fishing interests can be best protected by allowing a minister from Scotland to lead upcoming Brexit fishing negotiations. 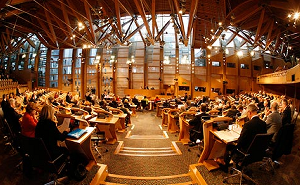 “It’s essential that the Scottish Parliament have these kinds of debates. Scottish fishing has historically been underrepresented in international negotiations – it’s time that ended. It’s time we listen to our fishing communities and this debate is part of that listening process. “This debate will allow us to discuss how to ensure a thriving, sustainable UK fishing industry. Full control of our coastal waters is an incredible opportunity for our coastal communities – It’s vital we protect that. 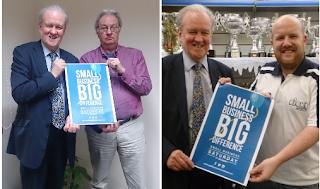 SNP MSP for Banffshire & Buchan Coast, Stewart Stevenson, has offered his support for this weekend’s Small Business Saturday – which encourages people to shop locally and support their local businesses. Mr Stevenson visited Duncan Leel owner of Dicks Sports in Fraserburgh and was accompanied by local Federation of Small Businesses representative and small business owner Archie Miller of Macrae Stephen & Co as part of Small Business Saturday. Mr Stevenson took the opportunity to point out SNP Government action to support small businesses across Scotland, including the small business bonus and the £500m growth fund. Statistics from the Scottish Government show there are 13,935 small enterprises across Aberdeenshire – contributing greatly to the local economy. “Small Business Saturday is an excellent initiative and one which helps to support local businesses throughout the North-east. “The SNP in government has always made efforts to support small businesses across the North-east, from introducing and extending the small business bonus to launching a growth fund worth £500m to deal with the new challenges created by Brexit. “Small businesses are the lifeblood of Scotland’s economy, supporting jobs and growth in our communities, as well as providing an invaluable service to people across the North-east. With almost 14,000 small enterprises across Aberdeenshire Council Area, there’s plenty of opportunity for people to get out and shop locally. "I had some excellent discussions with small business owners Duncan and Archie. They've got great ideas about what else we can do to keep Scotland's small enterprises and the Scottish economy thriving – from the digital economy to partnering with local schools to provide young people with work experience. It's great to have these kind of innovative businesses in my constituency – they are vast assets to our local communities. “I encourage all constituents to support their local independent businesses all year round, but particularly on Small Business Saturday. With the week coming just weeks before Christmas in the busiest retail time of the year, people should use the opportunity to look at what is on offer in the local shops in the North-east. Banffshire & Buchan Coast MSP, Stewart Stevenson has congratulated two local students on their Scarf School Calendar Competition award. 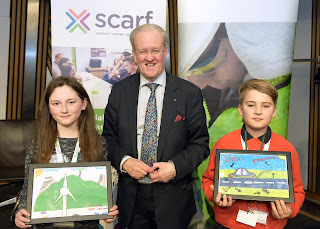 Mr Stevenson attended the award ceremony in the Scottish Parliament where the event recognised winners of the Scarf School Calendar Competition. Among the winners were local students Robyn Wallace-Jamieson of Crossroads Primary School, Grange and Jake Watson of King Edward School, Banff, who won for their artistic submissions demonstrating how to be energy efficient and reduce carbon emissions. 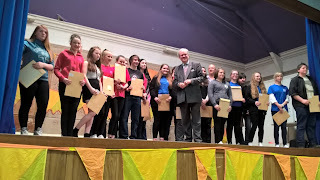 The event was attended by winners from schools across Aberdeen City, Aberdeenshire, Angus, Dundee City and Moray Council local authority areas and their parents. The 2016 calendar attracted hundreds of fantastic entries from primary schools throughout the region. A total of 14 pupils were selected for the calendar. “I am very proud of my young constituents and for all those who took part in the calendar competition. They’ve created beautiful pictures that reflect creative solutions to saving energy and protecting our communities from climate change. As former minister for environment and climate change, I’m highly impressed by their work and participation. “Both Robyn and Jake managed to create interesting, thought provoking art. They’ve clearly put a lot of work into their submissions and the calendar is lucky to have them. I would also like to congratulate all the young people who took part – their creativity, work ethic and awareness are the foundation for combating climate change and creating a world that’s more energy efficient. “Cold calling can be very distressing, particularly for vulnerable people across the North-east – and can go as far as causing financial hardship and even leave people too scared to answer their phones.